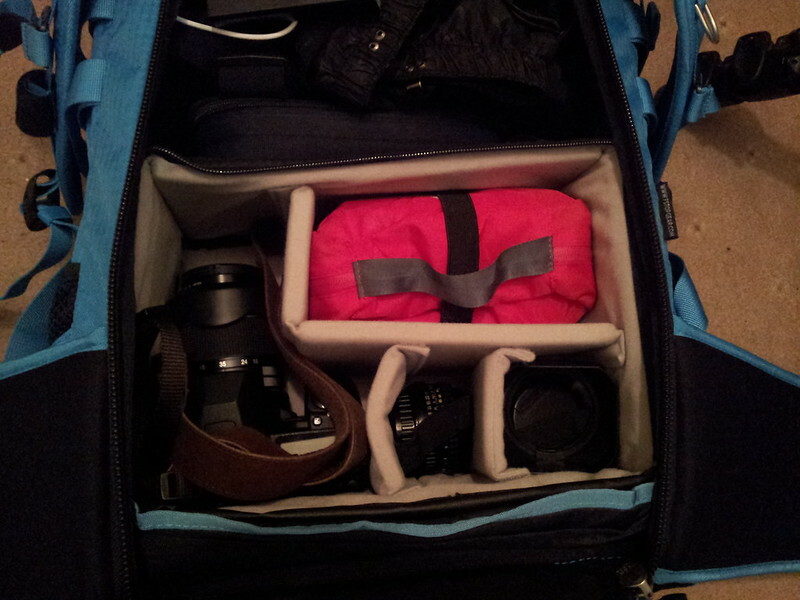 About a year ago I was on the lookout for a new bag to carry my ever-growing selection of photography gear around in. The small messenger bag I owned I had bought years before for a Panasonic bridge camera, but now I own a DSLR, four lenses and an assortment of cleaning products, filters, extra batteries, a tripod etc. I had also started hill walking in the Scottish highlands, and consequently looked for a backpack instead of a messenger bag. My requirements included a pleasing design, integration of camera compartment and daypack, high quality and durability, good comfort on long hikes, direct access to my camera with attached lens and an affordable price point. The f-stop Loka fulfilled all of these requirements but the direct access, plus the price was a little steep, but in the end I still went for it. I have now used the Loka quite a bit, on several full-day hikes and hill walking in the best and the worst weather the Scottish highlands have to offer, on casual hikes in the Namibian desert and mountains, for travelling around Germany to visit friends and family, and just to lug my gear around the city – enough to form a judgement on what this pack excels at (spoiler alert: a lot) and what could be improved (another spoiler: very little). However, a couple of months ago f-stop discontinued the Loka in favour of its successor, the Ajna. However, there have been some massive delays in delivery of f-stop’s latest products, with some customers having to wait over half a year for their orders, so for those looking to buy a backpack right now the Loka (either left stock or used) might still be a viable option. And the Ajna is a fairly insignificant update anyway, so you can use this review any way you want – as an aid to help you decide whether to purchase that used (or stock clearance) Loka, as an approximation of what the Ajna may do for you, or as a general reflection on f-stop products. I could not find out when f-stop introduced the Loka, but the majority of reviews were written in early 2013, so I assume the market launch to have been late 2012 or early 2013. The backpack holds 37l, weighs 1.57 kg, measures 21.6 x 30.5 x 55.9 cm on the outside and I paid €209 for the Loka and €55 for the Small Pro ICU, for a total of €264. Uff – not exactly a bargain. However, due to its compact size the Loka fits major airlines’ carry-on luggage restrictions, provided it is not stuffed to the brim. I frequently take it with me as a carry-on on notoriously pedantic Irish low-cost airline Ryanair, and have never had any problems. The backpack also comes in a large, soft protective pouch which you can stuff it in to avoid the straps getting caught and ripped on airport conveyor belts in case you ever want to check it as luggage. 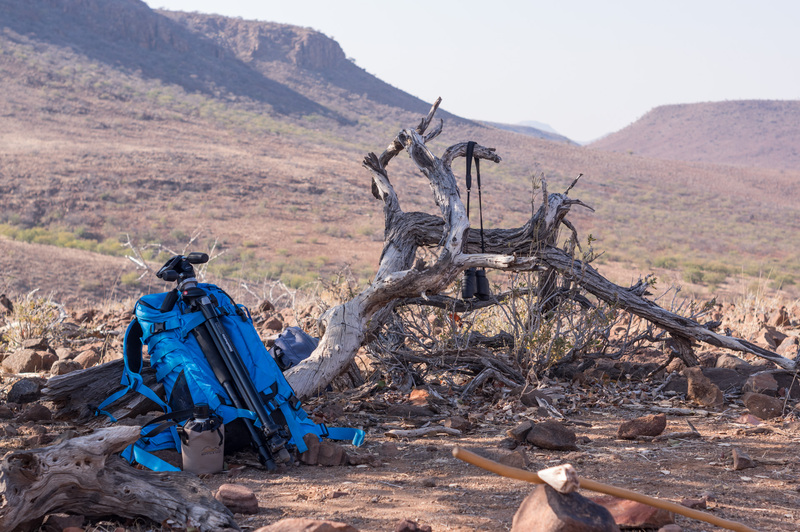 For its Mountain Series backpacks f-stop follows a modular approach – you choose your backpack based on your volume requirements, and then you choose an ICU (internal camera unit) based on how much gear you would like to carry around. The range of ICUs includes several types (‘Pro’, ‘Slope’ and ‘Shallow’) and sizes (‘Small’, ‘Medium’, ‘Large’, ‘XL’ and a couple special ones), and the Loka can take small, medium, large, or two small on top of each other. The ICUs are stuffed into the backpack and can be fastened with velcro straps. Based on my camera gear and my wish to have as much space as possible for non-photographic gear (layers, food, helmet, crampons …) I chose the Small Pro ICU. Let’s face it – apart from a couple of notable exceptions most dedicated photography backpacks are ugly-as-something, black, cuboid things. The Loka is different. It comes in a range of bright colours (mine is blue as the sky), has an elegant shape and … well, I’m not good at putting visuals into words, so let’s just say it looks pretty sleek. The quality of materials used is top-notch. Everything feels solid and after almost a year of use the only sign of wear I can make out is a bit of dirt. There are no tears, no scratches and nothing is unravelling, so I would rate the fabric as pretty resistant against abrasion and the workmanship and sewing as excellent. From my experience the material is very weather resistant, albeit not being marketed as ‘waterproof’. In light rain I do not bother getting the rain cover out, but in a proper downpour I do. The zippers on the back and for the little top pocket are sealed, however the ones for the top-access flap and the back panel are not. Especially the latter may be at risk for taking up water as it is fairly large and cannot be covered by the rain cover. However, so far I have not noticed any ingress even in fairly detrimental conditions. The bottom of the pack is covered by a thick layer of rubber, so you need not be afraid to put it down on the likes of sharp rocks. Overall, I expect the Loka to last me a long time, and the same can be said about the ICU. The Loka features a number of pockets. On the outside we find a long, flat pocket on the front for stuffing in a windbreaker or hardshell, a pocket on top for your usual bits and pieces which contains another two little slots (one can be closed with velcro) and a key ring, and two mesh pockets on either side that each hold about a 0.75l bottle, or tissues, or trash, or whatever you want to stuff in. On the inside we have a little mesh pocket on the bottom side of the top lid that usually holds my phone, and a number of little pockets and slots on the inside of the back panel that are well suited to hold memory cards, filters and documents. The outside features a wide range of attachment points of which I have used very few. Many of these straps are MOLLE standard (a carrying system used by the British and US militaries) and allow attachment of further bags and pouches on the sides of the backpack, the belt strap and possibly (?) the shoulder straps too. All I have ever used them for was to strap an ice axe to the side of the Loka, which worked well. One of the Loka’s main selling points is certainly the back panel which can be unzipped and folded backwards. 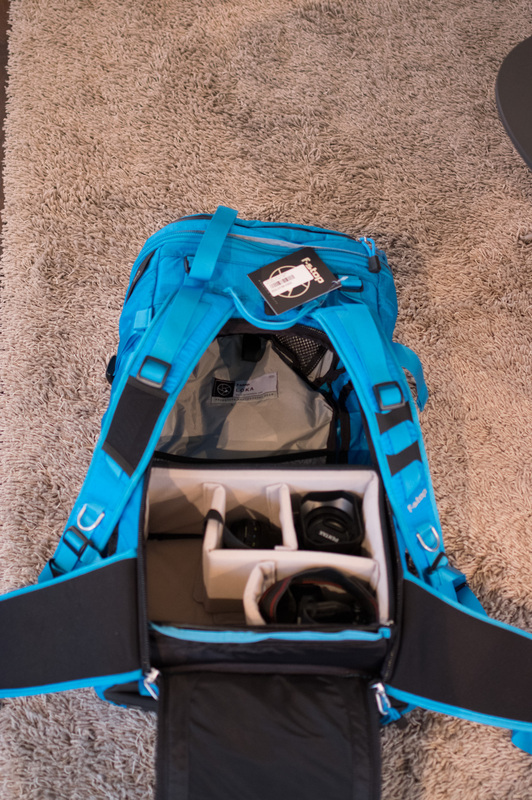 Presumably designed to allow access to your camera gear in the ICU, it also allows for easy access to everything else in the daypack compartment. 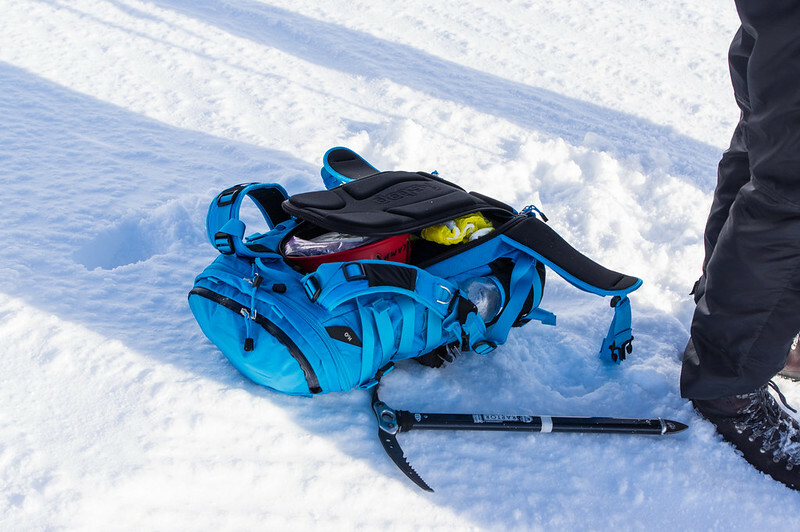 With most other mountaineering backpacks you need to make up your mind and pack them not only in line with optimal weight distribution, but also prioritise on items carried. You usually only have access through the top, so everything you need a lot goes to the top, everything you are unlikely to need goes to the bottom. With the Loka that doesn’t matter, because through the back panel everything is accessible. 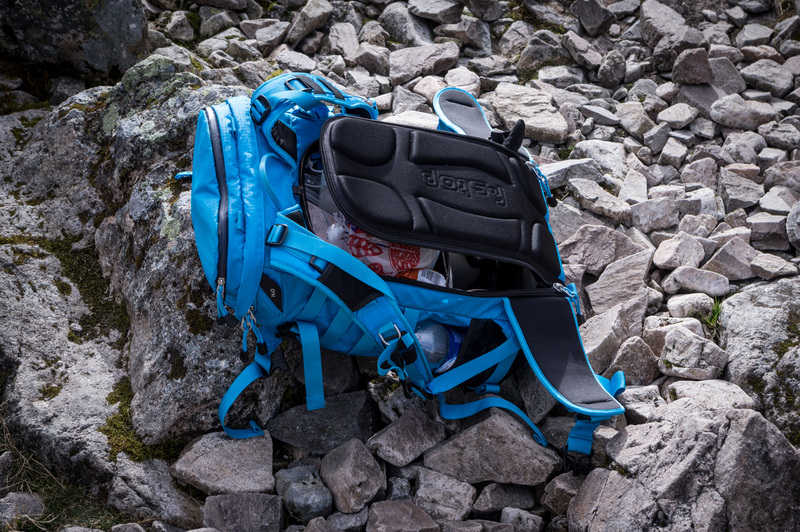 There is one main drawback though – the Loka has an integrated pouch and H2O exit port for a hydration system, but due to the back panel access that pouch is located on the side of the backpack furthest away from the wearer’s back. Water is heavy, and in terms of carrying comfort and weight distribution you want the heavier stuff close to your back, not the other way around. I have yet to buy a water bladder though, so I cannot comment on how much of a problem that is in real life. Even though I opted for the smallest ICU in the ‘Pro’ range it easily holds all my kit and a small first aid kit. If you have a look at the second picture in this article, in my personal configuration the left compartment holds my K3 with either the standard or tele zoom attached, the two smaller compartments hold the other zoom and my two little primes respectively, and the large upper left compartment holds my first aid kit. The ICU comes with more dividers (I have two lying around which I don’t currently need) and a couple of elastic velcro straps to keep your gear in place. The same that can be said about most photography backpack’s looks can also be said about the comfort of carrying them around – both are usually not the best. In the past I have tried on a couple of camera backpacks owned by friends and acquaintances, and was rather disappointed with the carrying system. Again, the Loka is different. Its straps and hip belt are thick and well padded, and the back panel’s padding is at least a centimetre thick. A number of adjustment straps enable the wearer to tailor the system to his or her body, which works pretty well. All in all the Loka is not quite as comfortable to wear as my big 70l trekking backpack, but comes very, very close. I can definitely carry it around comfortably all day fully loaded without any issues. So far the Loka has held up exceptionally well. I carry it every time I go out into the Highlands, and it holds everything I need for a day trip. And should I ever feel like I would not need a camera that day, I could just take the ICU out and have even more space. Not having direct access to your camera via a small opening at the side might initially appear as a major annoyance, but in practice sliding the backpack off your shoulder, unzipping the back panel and grabbing the camera takes me anywhere between 5 and 10 sec. I have also had several experienced hillwalkers and trained mountain guides comment favourably on the design – they really seemed quite positively surprised about the entire back panel opening up and giving direct access to all the gear. Something I don’t like that much is attaching and carrying around my tripod, but that is mostly due to my tripod. I use a Manfrotto 055XPROB, which is fairly large and heavy. In fact, it is longer than the Loka itself, so when I strap it to the front of the pack and put the pack down, it continues over the bottom part and as I put the pack down, the tripod is pushed upwards (see picture above). It is also so heavy that the straps that are supposed to hold it tight and close to the fabric are occasionally loosening over time when carrying it. I guess a smaller and lighter travelling tripod would not cause any problems, and could be attached on the pack or on either side of the Loka. There is no doubt that €210 is quite a lot to ask for a backpack – and that doesn’t even include the ICU. Heck, Arc’teryx’ and Haglöf’s top-of-the-line backpacks are cheaper than this! At such a high asking price, the product better delivers exceptional quality and smart features to justify the expense. One notable point here is that f-stop decided not to include a rain cover – it has to be purchased separately for €15. I strongly feel that at €210 it is very cheap of f-stop to not include it, especially since it’s not exactly a costly thing to produce. Whether this backpack is worth its money is really up to everyone to decide for themselves. It is very well made and features a host of smart features. And then there’s the fact that there simply is no competition – there are some very good camera backpacks out there, but to my knowledge f-stop are the only company that follows a modular approach. I decided to purchase it and have not regretted it. Also bear in mind that it doubles as both a photography backpack and a normal backpack for day trips or short multi-day hikes. Update: If you believe this ‘Inside look’ that claims f-stop gear to be “falling apart at the seams” and has been widely cited across the photography related media in the last couple of days, the company appears to be in serious trouble, having had delivery problems for months with some people waiting half a year or more on their ordered products, failing a Kickstarter campaign with no refund offered and being millions in debt. As much as I love my Loka, maybe buying one of their products would not be the smartest move right now in case the company will not be around any more to honour warranty claims in the future, or even faltering before your purchase ships. Can you please let me know if there are good connection point if you are to stack 2 small PRO ICUs on your LOKA bag? Thanks for checking this for me! Hi Willie, sorry for the late reply. There are two sets of plastic attachment loops inside. My Small PRO ICU takes up one set and you can stack a second on top that attaches to the upper loops. Fits perfectly.